Friends of the late Jane Clark Brown describe her as a terrific artist but a terrible self-promoter. 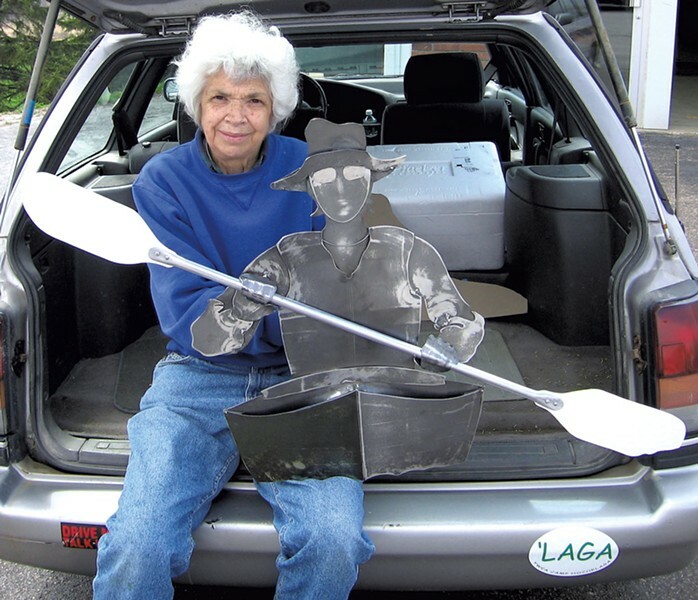 Best known for her children's-book illustrations but equally proficient in sculpture and watercolors, Brown "never sold anything," says her friend Marty Leech. "She gave things away." Joan Curtis tells Seven Days via email, "Jane couldn't have been more self-effacing or modest. [She didn't want] to call attention to herself." Brown, who lived nearly all her life in the Burlington area, may have eschewed the spotlight, but a lesser-known branch of her art courted controversy. 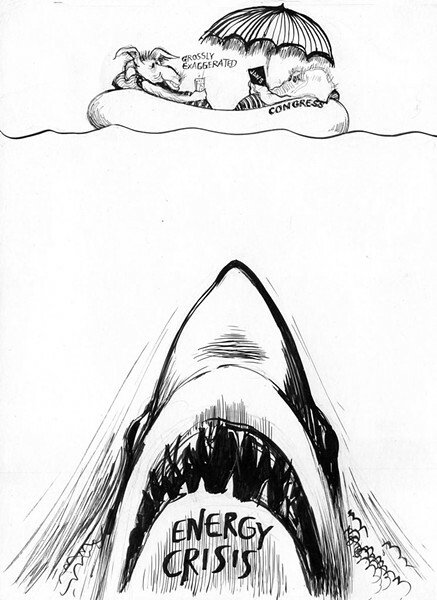 From 1968 to 1975, Brown produced more than 300 no-punches-pulled editorial cartoons for the Suburban List, an erstwhile weekly newspaper in Essex Junction. Never anthologized and nearly forgotten, those cartoons were rediscovered recently, and they're exhibited this month at Burlington's Fletcher Free Library. Jim Brown, the artist's son, concurs that she rarely spoke of her days as a political cartoonist, when she regularly addressed such turbulent topics as Watergate and the Vietnam War. But he knew about his mother's cartoons and searched for them for years. Jim and his brothers finally discovered them after Jane's death in 2009, while cleaning out their parents' house to prepare it for sale. 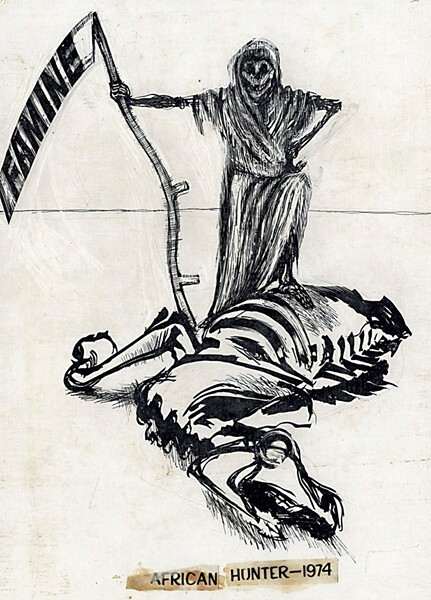 An exhibit a few years ago, also at the Fletcher, highlighted Brown's work in several media, but her editorial cartoons could be shown only in subpar copies. The current show — organized chiefly by Jim Brown, Curtis and Leech — displays about 150 editorial cartoons on panels, and many more in binders. At long last, the cartoons have been identified, catalogued and grouped by subject matter. Readers who grew up with Brown's gently humorous children's-book illustrations may be surprised by the sharpness of the cartoons' political views and the jagged assertiveness of her inked line. It's difficult to reconcile the woman who illustrated Vermont author Katherine Paterson's 1991 book The Smallest Cow in the World with the artist who created a particularly ghoulish Grim Reaper in a 1974 cartoon about pervasive African famine. But, as Curtis describes her late friend, "She was a gentle person with strong, rugged opinions." As an editorial cartoonist, Brown took on subjects ranging from Vermont politics to national issues, none of which would seem to have prepared her for later writing and illustrating Whonk, and Whonk Again. Still, Jim Brown believes his mother's "strong attention to detail" links the works of these two phases of her career. "I don't think her style really changed over the years," he says. "It's just that the medium she was working in changed." In her time at the Suburban List, Brown gained a reputation as an artist whose left-leaning opinions were as sharp as her pen. Ruth Page, now 93, is the former editor of the paper. She remarks, in a statement for the exhibit, "Jane could have sold her work to much larger papers for more money. We could only conclude that she really liked our editorials. We were very critical of President Richard Nixon. I got a kick when I discovered that Jane felt about him just as I did." Jim Brown doesn't know why his mother's career as an editorial cartoonist ended in the mid-1970s, though he speculates that she was finally able to realize her longtime goal of writing and illustrating her own books. She went on to illustrate three of Paterson's books, and several by other authors, and wrote and illustrated two of her own. Brown also created a well-remembered kids' activity book called The Vermont Fun Book, first published in 1969 — just when she would have been drawing cartoons about nuclear proliferation and Vietnam. Now unearthed and on display, Jane Clark Brown's editorial cartoons reveal the fiery side of an underappreciated Vermont artist. The original print version of this article was headlined "Late Local Artist's Punditry Shines in Rediscovered Editorial Cartoons"
What's the Story Behind an Ad Seeking a Stolen Sculpture?